Metal cut-out 3D, puzzle up models. Big Ben (London) - metal 3D pre-cut to mount kit Mounting without glue or paint, just a small pliers. Kit on pre-cut metal plate.Sheets of steel to high-quality 3D models!Simply extract the pieces and assemble them using the tabs and holes. Box type DVD. 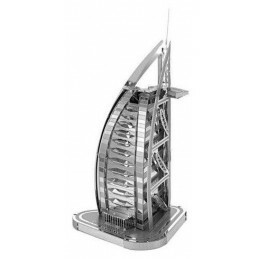 Tower Burj Al Arab (Dubai) - metal 3D pre-cut to mount kit Mounting without glue or paint, just a small pliers. Kit on pre-cut metal plate.Sheets of steel to high-quality 3D models!Simply extract the pieces and assemble them using the tabs and holes. Box type DVD. 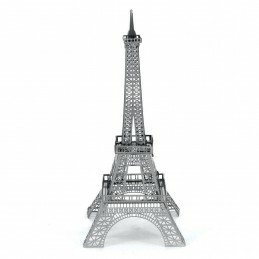 Eiffel Tower (Paris) - metal 3D pre-cut to mount kit Mounting without glue or paint, just a small pliers. Kit on pre-cut metal plate.Sheets of steel to high-quality 3D models!Simply extract the pieces and assemble them using the tabs and holes. Box type DVD. Arch of triumph (Paris) - kit metal 3D pre-cut to climb Mounting without glue or paint, just a small pliers. Kit on pre-cut metal plate.Sheets of steel to high-quality 3D models!Simply extract the pieces and assemble them using the tabs and holes. Box type DVD. Bass guitar - metal 3D pre-cut to mount kit Mounting without glue or paint, just a small pliers. Kit on pre-cut metal plate.Sheets of steel to high-quality 3D models!Simply extract the pieces and assemble them using the tabs and holes. Box type DVD. Guitar lead - metal 3D pre-cut to mount kit Mounting without glue or paint, just a small pliers. Kit on pre-cut metal plate.Sheets of steel to high-quality 3D models!Simply extract the pieces and assemble them using the tabs and holes. Box type DVD. Harp - kit metal 3D pre-cut to climb Mounting without glue or paint, just a small pliers. Kit on pre-cut metal plate.Sheets of steel to high-quality 3D models!Simply extract the pieces and assemble them using the tabs and holes. Box type DVD. Piano - kit metal 3D pre-cut to climb Mounting without glue or paint, just a small pliers. Kit on pre-cut metal plate.Sheets of steel to high-quality 3D models!Simply extract the pieces and assemble them using the tabs and holes. Box type DVD. Heels - metal 3D pre-cut to mount kit Mounting without glue or paint, just a small pliers. Kit on pre-cut metal plate.Sheets of steel to high-quality 3D models!Simply extract the pieces and assemble them using the tabs and holes. Box type DVD. 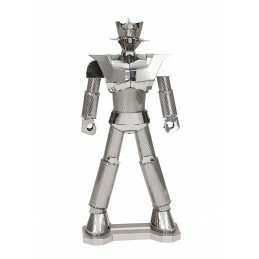 Mazinger Z - kit metal 3D pre-cut to climb Mounting without glue or paint, just a small pliers. Kit on pre-cut metal plate.Sheets of steel to high-quality 3D models!Simply extract the pieces and assemble them using the tabs and holes. Box type DVD. M35 anti-aircraft - kit metal 3D pre-cut to climb Mounting without glue or paint, just a small pliers. Kit on pre-cut metal plate.Sheets of steel to high-quality 3D models!Simply extract the pieces and assemble them using the tabs and holes. Box type DVD. Sungnyemun (Seoul) - kit 3D metal door starting to rise Mounting without glue or paint, just a small pliers. Kit on pre-cut metal plate.Sheets of steel to high-quality 3D models!Simply extract the pieces and assemble them using the tabs and holes. Box type DVD. Bridge Tower Bridge (London) - kit metal 3D pre-cut to climb Mounting without glue or paint, just a small pliers. Kit on pre-cut metal plate.Sheets of steel to high-quality 3D models!Simply extract the pieces and assemble them using the tabs and holes. Box type DVD. 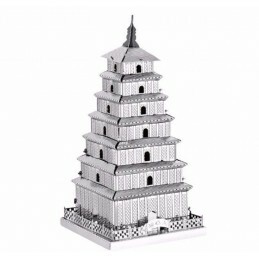 Taj Mahal (India) - metal 3D pre-cut to mount kit Mounting without glue or paint, just a small pliers. Kit on pre-cut metal plate.Sheets of steel to high-quality 3D models!Simply extract the pieces and assemble them using the tabs and holes. Box type DVD. Temple of Heaven (Beijing) - kit metal 3D pre-cut to climb Mounting without glue or paint, just a small pliers. Kit on pre-cut metal plate.Sheets of steel to high-quality 3D models!Simply extract the pieces and assemble them using the tabs and holes. Box type DVD. Villa of architect - metal 3D pre-cut to mount kit Mounting without glue or paint, just a small pliers. Kit on pre-cut metal plate.Sheets of steel to high-quality 3D models!Simply extract the pieces and assemble them using the tabs and holes. Box type DVD. Cathedral of St. Basil (Moscow) - kit metal 3D pre-cut to climb Mounting without glue or paint, just a small pliers. Kit on pre-cut metal plate.Sheets of steel to high-quality 3D models!Simply extract the pieces and assemble them using the tabs and holes. Box type DVD. 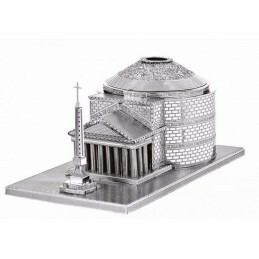 Cathedral of our Lady of Paris - kit metal 3D pre-cut to climb Mounting without glue or paint, just a small pliers. Kit on pre-cut metal plate.Sheets of steel to high-quality 3D models!Simply extract the pieces and assemble them using the tabs and holes. Box type DVD. Carousel horses - metal 3D pre-cut to mount kit Mounting without glue or paint, just a small pliers. Kit on pre-cut metal plate.Sheets of steel to high-quality 3D models!Simply extract the pieces and assemble them using the tabs and holes. Box type DVD. Cathedral of St. Patrick (New York) - kit metal 3D pre-cut to climb Mounting without glue or paint, just a small pliers. Kit on pre-cut metal plate.Sheets of steel to high-quality 3D models!Simply extract the pieces and assemble them using the tabs and holes. Box type DVD. Violin - kit metal 3D pre-cut to climb Mounting without glue or paint, just a small pliers. Kit on pre-cut metal plate.Sheets of steel to high-quality 3D models!Simply extract the pieces and assemble them using the tabs and holes. Box type DVD. Movie projector - metal 3D pre-cut to mount kit Mounting without glue or paint, just a small pliers. Kit on pre-cut metal plate.Sheets of steel to high-quality 3D models!Simply extract the pieces and assemble them using the tabs and holes. Box type DVD. Phonograph - kit metal 3D pre-cut to climb Mounting without glue or paint, just a small pliers. Kit on pre-cut metal plate.Sheets of steel to high-quality 3D models!Simply extract the pieces and assemble them using the tabs and holes. Box type DVD. Turtle boat - kit metal 3D pre-cut to climb Mounting without glue or paint, just a small pliers. Kit on pre-cut metal plate.Sheets of steel to high-quality 3D models!Simply extract the pieces and assemble them using the tabs and holes. Box type DVD. Boat Panokseon -metal 3D pre-cut to mount kit Mounting without glue or paint, just a small pliers. Kit on pre-cut metal plate.Sheets of steel to high-quality 3D models!Simply extract the pieces and assemble them using the tabs and holes. Box type DVD. Railway Gun - metal 3D pre-cut to mount kit Mounting without glue or paint, just a small pliers. 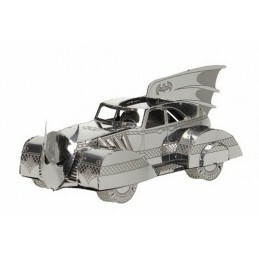 Kit on pre-cut metal plate.Sheets of steel to high-quality 3D models!Simply extract the pieces and assemble them using the tabs and holes. Box type DVD.